UTIG researcher Joseph Levy and Jackson School postdoctoral associate Timothy Goudge, collaborating with colleagues from Brown University, NASA, and Mount Holyoke College, are studying depressions on the surface of Mars which could be a new place to look for signs of life on the planet. 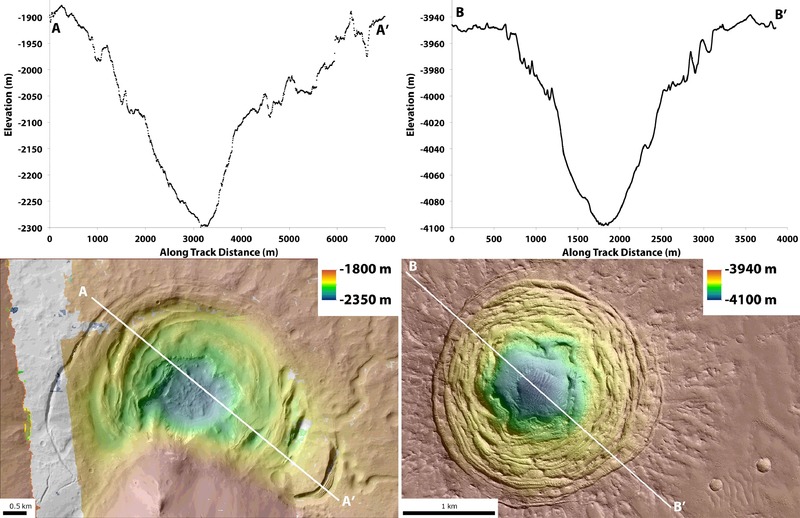 Levy was the lead author of a new paper based on this research, titled “Candidate volcanic and impact-induced ice depressions on Mars” published in Icarus: The international journal of Solar System studies. 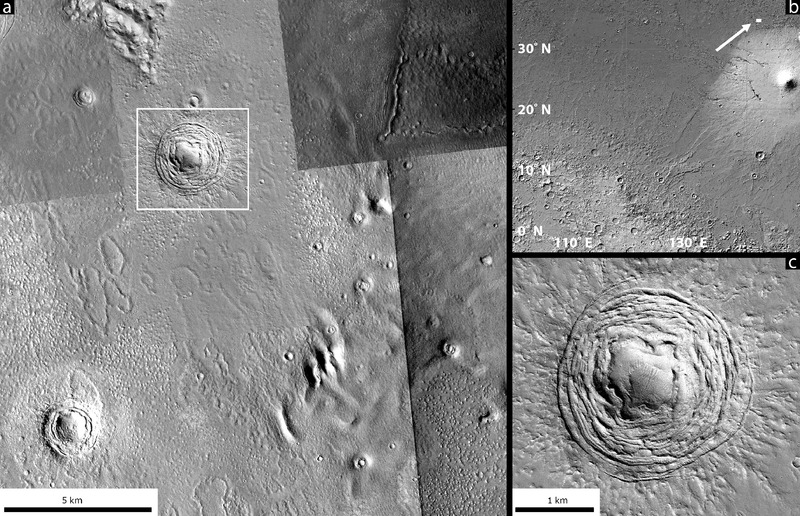 “We identified several landforms on Mars whose appearance suggested that they formed when the surface collapsed. Since two of them (one in Galaxias Fossae and the other in northern Hellas) are in terrains that are thought to be ice rich, we tested the hypotheses that they either formed from meteorite impacts or under-ice volcanic eruptions,” explains Levy. The depressions are concentrically-fractured, similar to “volcanic ice cauldrons” on Earth that form in Iceland when volcanos melt ice beneath an ice cap. The combination of heat, meltwater, volcanic gases, and geological weathering products makes these kinds depressions little oases for microbial life. On Earth, these lakes usually drain as glacial outburst floods, but there is no evidence of flooding on Mars—rather, the meltwater must have refrozen or evaporated away. The stereo imaging works the same way that your eyes create a three-dimensional picture of the world around you. Two pairs of high resolution camera images were taken over each site and a code uses these two views of the surface to calculate the distance between the Mars Reconnaissance Orbiter spacecraft and the ground surface. The results from the imaging were surprising to Levy. “Both depressions were found to be very funnel-shaped—they are wide at the surface and then narrow down to a steep-walled cavity. This is very different from fresh craters, which are more bowl-shaped. 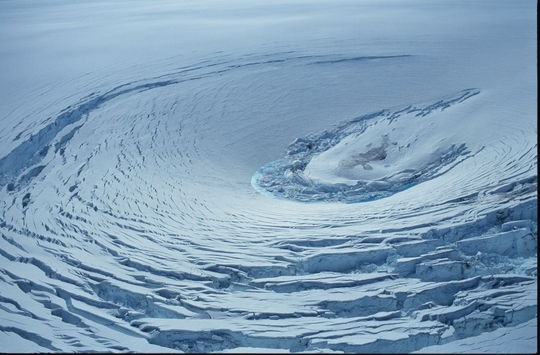 This suggests that ice was removed from under the surface, causing the ground to collapse into a cavity”, he said. Neither depression was well-fit by impact models, but the presence of ejecta around the Galaxias depression led the researchers to conclude that it was most-likely impact related. The North Hellas depression had much less evidence for the impact mechanism, leading them to prefer a volcanic origin for it. It was found that it would take very little magma—about the size of a very small volcanic intrusion – to melt out cavities the size of the ones observed in Galaxias and North Hellas.